Scathing reviews like this one are the scourge of businesses who find themselves on Yelp, Angie’s List, Houzz, HealthGrades, or other user-feedback sites. After all, it only takes a single vindictive customer, enraged by a perceived slight, to tear your company’s reputation to shreds. 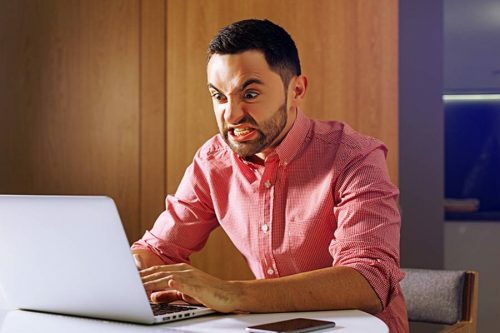 It’s scary: one irate consumer can easily go on a rampage, littering the internet with one-star reviews and detailed tirades. In an instant, it seems, any customer searching for your product or service will be scared off from choosing your business. So should you lay low and avoid putting your company on these sites in the first place? Or should you jump in and use them as a marketing asset? 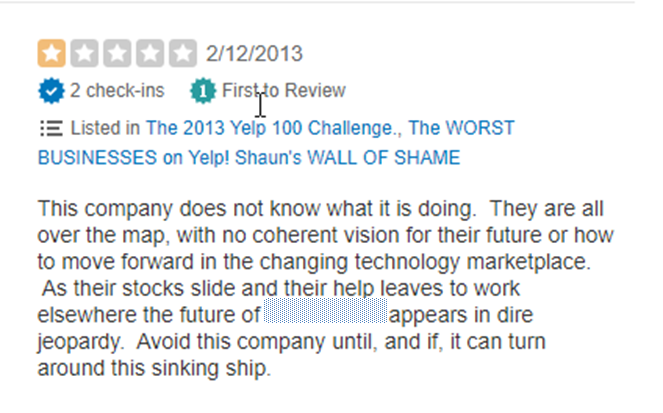 And if your company does end up on the chopping block, should you respond to the negative review? Fight fire with fire? Or should you ignore a bad review, knowing that prospective customers will see it and possibly believe the worst? Large businesses have very little choice about whether they would like to be on these sites. Their volume of consumer interactions forces their names into the internet’s limelight. But for small businesses, it truly is a quandary. Should they put themselves at risk of attracting rants like this one? While it can be tempting to stick your head in the sand and pretend that these sites don’t exist, a growing company will not be able to hide from them for long. Your competitors are on these sites, your prospective customers are searching on these sites, and it’s only a matter of time before a customer posts up your business’s name – whether you like it or not. Your best bet is to actively embrace them, using them as a powerful marketing tool, instead of embarking on a futile struggle to avoid them. Once you’re on these sites, use them as a marketing tool by flooding them with positive reviews from your customers. How? By actively encouraging your satisfied customers to review your product or service. In fact, make a company policy to contact your customers after service (directly, or via phone or email), asking them to leave a review of your company. While venting about an unsatisfying experience comes naturally, satisfied customers may need an additional reminder to leave positive feedback. Note that you should never pay or bribe customers to leave a positive review. What you can do is encourage them to leave an unbiased view of their experience – while making sure to mention that they should contact you first with any outstanding issues so that you can address them. It’s also worth noting that Yelp, which has some of the most draconian policies of any review site, forbids businesses to ask for any reviews at all — even neutral ones. It’s important to expect, from the start, that you’ll receive a few negative reviews. If you’ve gotten a large number of negative reviews, however, chances are that you don’t have a marketing problem. You have a product or service problem. In this case, your primary goal should be to cure the sickness, not patch the symptom. Swallow the painful pill of customer feedback, and do some real company soul-searching. What are customers complaining about? Is there a way you can fix their grievances? Is a product that you’re selling actually sub-par? Are some of your employees turning off customers with their lack of bedside manner? Or do some of your policies (e.g., returns) fail to meet the expectations of the marketplace? But what if you have a quality product, stellar service, and still garner a couple of negative reviews every once in a while? You can’t please everyone all the time, but will those negative reviews turn off prospective customers? Strangely enough, a few bad reviews buried among a slew of positive ones actually make the overall list look better. Why? Because they provide a dose of realism. Everyone knows that nobody is perfect. An unbroken list of customers singing your praises looks like you embarked on a successful campaign to mobilize your happiest customers. A few grumblers make the reviews seem more “real.” And in the context of so many people leaving positive feedback, the few reviewers giving negative feedback look like grouchy whiners. So when you get a bad review, ignore it. Responding to an enraged customer will often trigger a nasty counter-response. The customer (“the victim”) ends up looking like a saint, leaving you (“the aggressor”) looking like a beast. The best policy, instead, is to drown out bad reviews with good reviews. 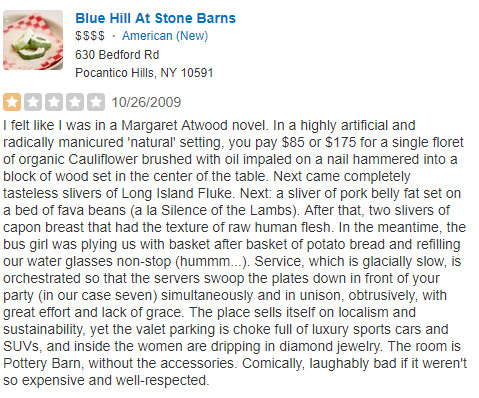 For example, this scathing review was left on a Yelp page of a high-end farm-to-table restaurant not far from Manhattan. On its own, it paints an extremely negative picture of the dining experience… but in the context of the other 593 reviews, this reviewer looks like an obvious crackpot. No written response would have changed this reviewer’s mind on the quality of the food or the ambiance; he was obviously looking for something quite different from what the restaurant had to offer. But the restaurant’s overall 4.5-star rating and rave reviews more than compensate for the single negative mudslinger. So don’t shy away from user-feedback sites. Instead, use them like the tools that they are. Encourage your satisfied customers to post reviews, ignore the inevitable detractors, and keep an eye out for constructive feedback that you can use to change your company for the better. Like what you see? Receive one article a month — join the Maelstrom Newsletter right here!